Due to popular demand and an insatiable urge to write, I've started a blog. Latest entry: USB v. Bench Scopes. This Fall we'll be doing a Better Firmware Faster seminar in Boston and one in Seattle - more info soon. I'm also getting interest in presenting it in Australia (maybe Melbourne) and New Zealand. To gauge interest in it, please email me if that's something you'd like to attend. Marybeth recently told me that we've done 400 of these seminars for companies at their locations and 48 public versions over the last two decades. Go here for information about bringing it to your company. Series terminations are still important in I2C devices. I've seen a wave of newer devices with fast open-drain drivers; when these drivers drive low, some significant undershoots can occur, especially on longer traces. I have definitely gotten complacent about I2C as it's generally a lot slower than many other interconnect protocols. There are still high speed transitions in I2C - design accordingly! I was going over some code recently and found a password stored in malloc-ed memory. That was quickly freed, so the password was deleted. But, of course, it wasn't. The password was still in the heap, potentially visible if those locations were ever returned to fulfill an allocation request. The code's author should have scrubbed those locations first, and then freed the memory. 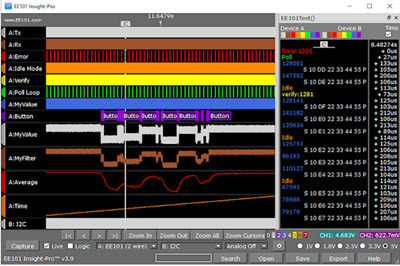 Jean Labrosse has a worthwhile article about measuring execution time on Arm MCUs. 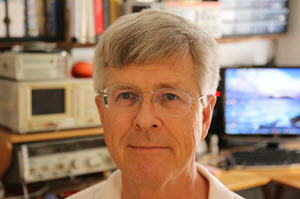 David Flagg won the Siglent 2 channel scope in last month's contest. Michael Pollan's advice about eating is concise: "Eat food. Not too much. Mostly plants." In a similar vein, I'd suggest about C code: "Use parenthesis. More than you'd think. Clarify expressions." Frankly, why would I want to clutter my mind with what in some cases are quite arcane rules, like & is higher than ^? Lint warns that the result of the expression is not only something the developer probably doesn't want, but that the expression always resolves to false. From time to time companies ask me to root through their firmware development processes and suggest ways to make improvements. The goal is usually to improve quality, but the ancillary benefit of shortened schedules often results. This effort goes under the well-known moniker "Software Process Improvement", or SPI. Often the effort comes from senior management's frustration with delivered defects. In some cases these have cost the company millions in recalls or lost sales. If it weren't for the NDAs I could tell you tales that would make you blanch. It's interesting that in no small number of these cases the companies feel their processes are state-of-the-art because they adhere to an ANSI or ISO standard. They're shocked when it turns out that though the standard is being met, more or less, the teams aren't using leading-edge processes so errors are leaking out into the field. SPI starts with interviewing at least a subset of the team members to gain an understanding of what each person actually does, and how they approach the job. I always ask what defined processes are used and how each goes about meeting those mandates. Without exception these interviews show that, yes, there is some defined process, but different people use only a subset of it. It's common to find the company has, for instance, a firmware standard or three that exist, well, somewhere, maybe, but some of the team members haven't seen it in years. Or that unit tests are employed with rigor... by a third of the team. Requirements are completely defined by a committee, but that document has been obsolete for months or years. Requirements are incompletely defined because it's perceived there just isn't enough time to elicit them. Or maybe the team got tired of paperwork and wanted to start building the system. Requirements are incompletely defined because it's impossible to know what they are. (Usually this is really an unwillingness to either create a sub-prototype or make the effort required). Requirements are changing so fast that no one knows what they are. Testing is ad hoc and incomplete. At 100 KLOC it's almost impossible, or at least extremely expensive, to get better than 97% test coverage. The one shining exception seems to be projects done to the DO-178C avionics standard which, for the most critical systems, requires complete testing traceability. The cost? By some reports, about 65% more than code not done to that standard. The upside? Code done to that standard has never caused a plane to crash. No metrics are routinely kept. Yes, a disastrous bug caused an all-hands alert, but no, it's not at all clear how many others have slipped through. I believe in metrics for a number of reasons, not the least of which is to ascertain a quantitative quality measure which can be used both as feedback in the quality initiative, and as a benchmark against industry standards. The top 0.4% of companies ship one bug per 3000 lines of code. The rest of us mostly don't even know where we stand. The tools are not adequate. The code does not conform to the firmware standard, if there is one. In fact, never, in all of the SPI audits I've done, has the code come close to adhering to the standard, when there was one. Bugs are accepted as a norm instead of being viewed as an indication of problems. And yet, no action is taken before a bug surfaces to find these errors; the team is reactive rather than proactive. Quality is a goal, but is neither measured nor actively planned for. Team training doesn't exist. For example, I see a lot of teams transitioning, or trying to transition, to C++ without any real OO skills. You can't learn this stuff on the job. Throwaway practice projects are needed so misconceptions from lack of knowledge don't poison a real product. These are all fixable given two conditions. First, management must support the SPI effort, give the team the resources needed, hold developers accountable, and be committed to the needed changes over the long-term. Second, the team must be engaged and willing to try new things. When my kids were new drivers I asked them to, throughout their driving career, be at least occasionally introspective about their behind-the-wheel behavior and skills. "Why didn't I use the turn signal at that intersection?" "Maybe I was following that motorcycle too closely." Unless we're willing to believe that we can improve our skills and make better decisions, we won't. The same goes for software engineering. Continuous improvement is the mantra behind the quality movement, and should be our goal as well. A lot of systems track relative time by using a hardware timer that counts clock pulses. In this case "time" is measured in ticks. This is a very simple bit of code, code that more often than not is implemented naively and incorrectly. Suppose you're using a 16-bit microcontroller. The on-board timer is probably also two bytes wide. There might be a prescaler that increments the timer only every so many clock pulses. For millisecond resolution with a 1.024 MHz clock a ten-bit divider will add one to the timer every millisecond. ... where timer_high is the value incremented by the interrupt service routine. Alas, this code simply does not work. Or worse, it will behave properly most of the time, only wreaking havoc sporadically in a non-reproducible fashion that's just about impossible to reproduce. Note that at this point the timer is 0xffff and timer_high == 0.
low is 0xffff. But now something insidious happens. The timer rolls over to 0x0000 and an interrupt occurs. That interrupt adds one to timer_high which is therefore 0x0001. low is still 0xffff but high is 0x0001. The result? Function timer_read() returns 0x1ffff, which is twice the real value. In a simple case perhaps the time is just off and there are no serious side-effects. But suppose math is being performed to compare the returned value with other times. Negative times might happen. Testing will probably not elicit the very random failure. There's really no ex-post facto way to capture these sorts of errors so careful design coupled with code reviews are your best defense. A simple solution is to stop the timer before reading it, but that will cause the system to lose ticks. Disabling interrupts won't help as between the read of the value in memory and the hardware timer the latter could roll over, giving us 0x0000 instead of a more reasonable 0x10000 or 0xffff. One approach is to call timer_read twice and look for monotonically-increasing values. Alternatively, timer_read could itself look for a timer overflow and make an appropriate correction. There are many situations like this where two or more reads are needed to access a value wider than the processor's word length. For instance, if an 8-bit processor is reading a 12-bit parallel shaft encoder that CPU will need to issue two reads to get the entire encoder's input. But the shaft is turning; the two reads could give the same sort of mishmash we saw above, and a similar sort of corrective strategy must be employed. Sometimes, when this is pointed out people think about their wide analog to digital converters. An 8- or 16-bit CPU trying to access a 20 bit ADC will take two or more reads. In this case, as Douglass Adams said "don't panic." ADCs have an internal latch which is updated after a conversion is complete, so there's no chance of this sort of situation happening.